Marlboro Day in New Jersey! The state of New Jersey offers an array of exciting events as well as a multitude of resources and means of entertainment. Freehold, Manalapan, and Marlboro, New Jersey are not excepted from this. Freehold has a fantastic site (http://twp.freehold.nj.us/) where residents can find out about local events, such as the very popular Oakley Farmhouse Spring Festival. Additionally, this site offers current and dated news stories, information on local garbage and recycling pick up, and other general information about Freehold, New Jersey. To view upcoming events in Manalapan, such as The National Night Out (Against Crime) on August 7, 2012, you can go to: http://www.mtnj.org/index.php. This website also features a community calendar, information and opportunities for employment, information on committees and departments in Manalapan, ways to get involved in the community, and so much more! Marlboro also has a website (http://www.marlboro-nj.gov/) chalk full of information on the town, local events, schools, and more. 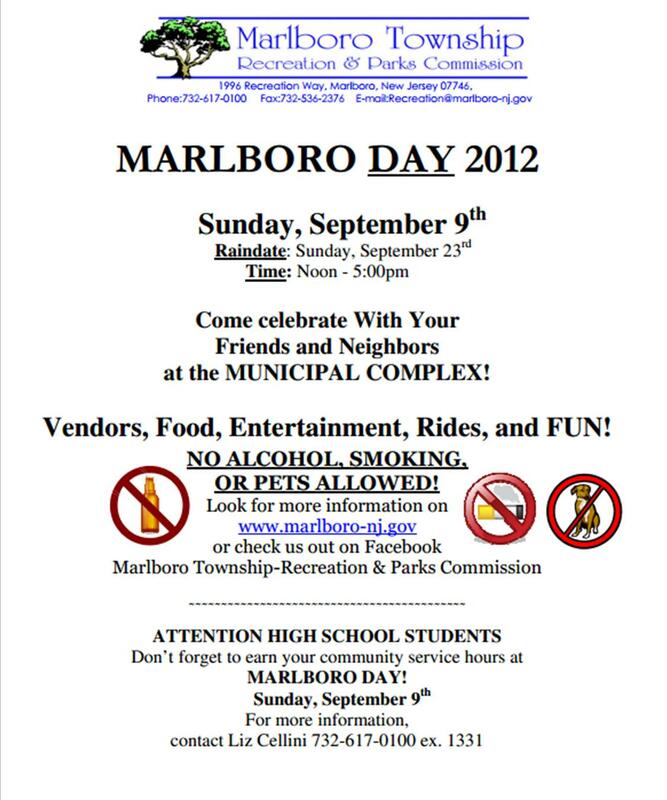 Marlboro even has a special day (Marlboro Day, on September 9 of this year) in which they celebrate their community. Furthermore, the site has all sorts of information on the committees of Marlboro, departments at your service, work opportunities, and tons of suggestions for entertainment purposes. What are the Upsides of Owning a Home? Financial benefits such as tax deductions, ability to build equity, greater borrowing power, and more. You become part of a tight knit community that includes your neighbors, your neighbors’ friends, local workers, etc. The longer you stay in one place, the more your house will feel like a home. Developing positive relationships with the people surrounding you will earn you friends that can help you through any problem you come across, home-related or not. You can change your home to fit your short-term and long-term needs. If you want to start, or continue, growing your family, you can customize rooms, i.e. turn that office space into a new nursery, or even build on to the house in some cases. If you’re short on cash, or your friend needs somewhere to bunk for a few weeks, you can rent out rooms. Or you could rent out that space above the garage, or your almost-empty-tool shed if someone needs extra storage space. Owning a home allows you endless opportunities to change and mold your space and your community to fit your needs. And moreover, owning a home leads to great financial benefits. proximity to schools, employment, hospitals, shops, public transportation, prisons, freeways, airports, beaches, parks, stadiums, and cultural activities such as museums, concerts and theaters. Additionally, http://www.marlboro-nj.gov/new_residents.html has tons of resources for new residents, such as school district information, church locations, voter registration forms, and tons more! For first time homebuyers, especially, it is a good idea to buy a home that meets your primary needs, in the best neighborhood within your price range. First time homebuyers typically have limited financial resources, so here are a few ways to ensure that you are picking a good location and staying within your price range. Look for communities that are likely to become “hot neighborhoods” in the coming years. These are often times the neighborhoods that are a bit farther out of the city. If commuting is a concern, purchase a home that is close to public transportation. Look to see if it is a “high demand” area by asking real estate agent if Marlboro sellers are receiving multiple offers on their homes, whether the gap between the list price and sale price is decreasing, and if there is active community involvement. You can also drive around the neighborhoods in Marlboro and see how many “sale pending” and “sold” signs there are in a particular area. If the homes in Marlboro are out of your price range, consider buying a condominium in the area. This way you are still able to live in a prime area.